Las Vegas - Technical Canyoneering Course (ACE-L1) + Monday Canyon! [nb: the $100 collected by Meetup for this course is the Deposit; the full course price is $395, so $295 will be due before the class begins. Don't forget to inquire about descending a local canyon with us on Monday!] Full calendar of courses and activities at http://uberadventures.net. Canyoneering is an emerging adventure sport that has grown significantly in popularity over the past decade. It combines hiking, wading, swimming, jumping, sliding, boulder-hopping, scrambling, down-climbing, sometimes packrafting and always rappelling — often over waterfalls! Physically, it takes less upper body strength than rock climbing, and is therefore a sport that can be enjoyed by a much larger spectrum of the population .. young or mature .. tall or short .. large or small. If you can hike, you can canyoneer! This sport has unique risks and requires a very specific set of technical skills to enjoy it safely ... and that's where we com in! This basic course gets you from "That looks cool!" ... to "Woohoo!" in 3 days! Check out these Vimeos and see why we are hooked on the sport! 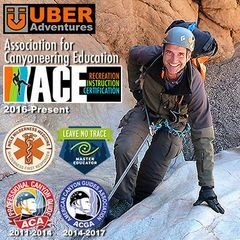 INSTRUCTION: UBER Adventures is America’s premier Canyoneering Instruction, Events and Community! We offer a variety of Canyoneering Courses to get the beginner/intermediate Canyoneer up-to-speed in his/her Canyoneering-specific skills; to provide intermediate Canyoneers with the skill set to tackle Advanced canyons; to train Leaders/Organizers the techniques and strategies for technical and group-management challenges; to teach individuals and groups the skills necessary to perform immediate in-canyon self-rescues, partner rescues and to assist with group emergencies; and ultimately to provide the comprehensive training for anyone interested in seeking certification as a Professional Canyon Guide. PREREQUISITE: None. This is a beginner to intermediate course which teaches the skills necessary to safely descend canyons as part of a group (being a competent participant and the knowledge to recognize and implement safe canyon practices). This course is designed to quickly get the beginner up-to-speed on basics, to give both the rookie and intermediate canyoneer new tools for his/her toolbox, and will help intermediate cayoneers refine their current skill set! TOPICS and SKILLS covered include: Knots-Bends-and-Hitches, Canyon Rating System, Rules-Ethics-Style-Communication-Courtesy, Specific Gear Choices-Requirements-Use-and-Care, Belays-Lowering-and-Handlines, Natural-Artificial-&-Human Anchors, Static and Contingency Riggings, Rope Deployment-Coiling-Bagging and Etiquette, Rappelling Techniques & On-Rope Skills (Adding Friction Pre-rappel, Mid-rappel, Locking Off, etc. ), Specialized Rappelling Techniques (Hard Starts, Soft Starts, Free-Hanging, Over-Hanging, etc. ), Basic Climbing & Down Climbing Skills (Bridging, Stemming, Partner Assists, Partner Captures, etc. ), Safety Checking and Basic Self-Rescue ...And, within each of these broad subjects are a myriad of skills and tools. INSTRUCTOR: Klaus Gerhart - ACE Master Instructor/Certified Guide, Certified Tactical Rappel Master, Wilderness First Responder, Advanced Swiftwater Rescue Technician, Technical Rope Rescue Technician, trained whitewater rafting guide, former Basic Mountaineering Instructor for Sierra Club's Wilderness Travel Course, Map & Compass Navigation Instructor and a Master Educator for Leave No Trace wilderness ethics. LOGISTICS: This class begins on Friday evening (7:00pm-9:30pm) at the Boulder Beach Picnic Area near the Water Safety Center in Lake Mead National Recreation Area, with an orientation, introduction, and presentation with an emphasis on the canyon rating system, gear, weather, canyon topography ... and getting to know each other. The class will reconvene on Saturday and Sunday at the same spot, and will run from 7am-5:00pm both days. If you're traveling to Las Vegas for this course, there is usually plenty of first-come/first-served camping available at the Boulder Beach Campground!